Originally brewed in 1975 to commemorate the bicentennial of Paul Revere's ride, Anchor's Liberty Ale is one of the American beer landscape's most important forefathers. Looking at a beer shelf today it might be hard to imagine, but back when Fritz and company first brewed up Liberty, there were simply no hoppy beers on the American market. This was it. Not only was it the first hoppy American beer since prohibition, it was also the first single-hop beer and the first dry-hopped beer since the dark days as well. Truly revolutionary stuff here. Anchor call Liberty an IPA, and it may well have been back when it was new, the market has moved on a little since the mid-70's. Therefore, I'm listing it as an American Pale Ale. I'm not alone in this, as its listed as an APA on virtually every beer site out there. The ingredient list is about as stripped down and simple as possible, with Anchor only claiming Two-Row Pale malt and fresh whole-cone Cascade hops. Certainly can't get much more pure than that. 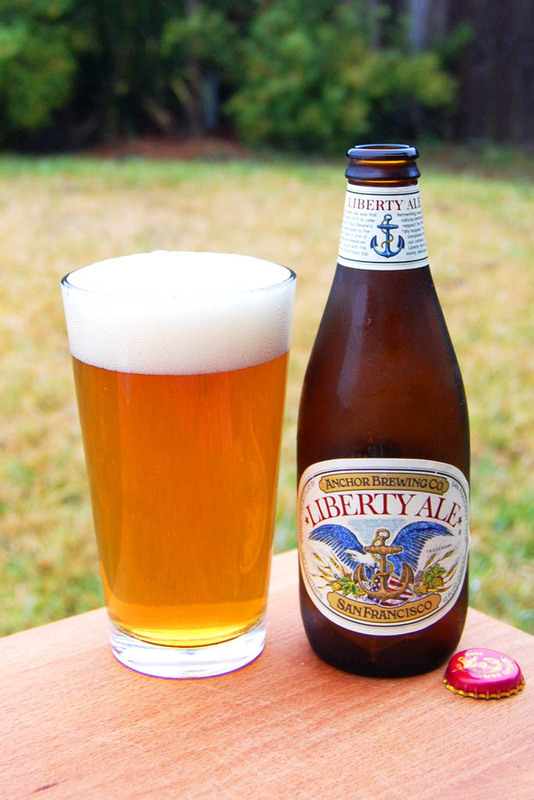 The champagne-like bubbles, distinctive hop bouquet, and balanced character of Liberty Ale revives centuries-old ale brewing traditions that are now more relevant than ever. So, how will the first hoppy modern American beer hold up now that hops are more prevalent than ever? Let's find out. Appearance: A slightly hazy golden-amber body capped by two fingers of creamy whitish head that feature terrific retention and lacing. Aroma: Bright, fresh, citrusy, and floral hops over a slightly grainy caramel malt body—I can already tell this is going to be solid. Taste: Up front, a wave of brassy and somewhat juicy citric hops lead the way. Underneath, there’s an understated biscuity malt backbone keeping everything in check. The end result is a well balanced English-style Pale Ale with some extra American-style bite. Leafy bitterness and biscuity grain in the aftertaste. Mouthfeel: Medium bodied and slightly creamy with smooth carbonation and a drying finish. Drinkability: A perfect session choice, this is a beer that aches for repetition. Verdict: Back in the dark days, I’m sure it took a pretty exceptional beer to get people back into drinking the hoppy stuff. Liberty obviously fit the bill back then, and is still a mighty tasty brew today. Despite the massive changes this beer has seen in it's 35+ years, it holds up beautifully. Respect your elders.